For the most part, the areas where home gardeners plant the citrus trees are the same areas where citrus is grown commercially. But if space is limited or climate isn’t suitable, it’s still possible to enjoy these trees and their bounty year-round. How? 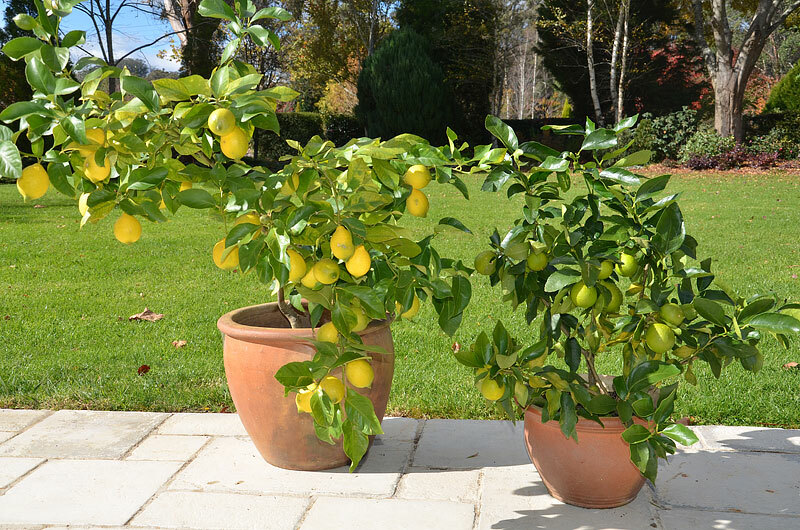 By growing citrus trees in containers. If you live in the mild-winter West, Southwest, or Southeast, you can grow most kinds of citrus in container outdoors year-round. Where winter minimum temperatures regularly dip below 25? F, you can still grow citrus trees if you have a bright spot indoors or out protected from frost. 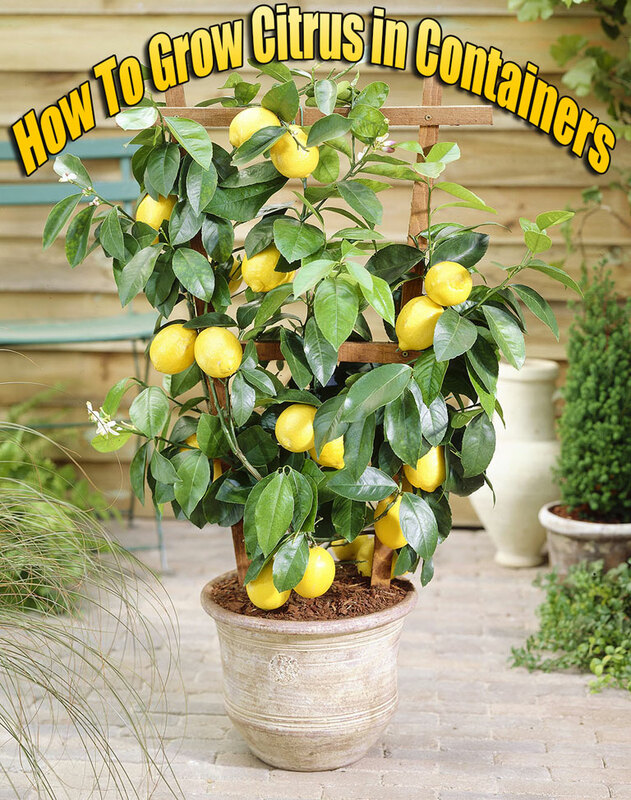 Any type of citrus tree can grow in a container, at least for a while. However, kinds such as lemon and grapefruit, which naturally grow into larger plants, will quickly outgrow their containers. Generally your best are the naturally small varieties such as ‘Improved Meyer’ lemon, ‘Bearss’ lime, ‘Satsuma’ mandarin, and kumquat. These varieties are more likely to remain both healthy and productive in containers for several years. Or choose any citrus that is grafted to Flying Dragon (Hiryu) rootstock. Any citrus growing on this rootstock will be significantly dwarfed, thereby extending its useful life in a container. Size and Type of Container. Choose a pot about the size of a 15-gallon nursery container. The ubiquitous half whiskey barrel is a good size, too. In traditional European orangeries, the classic container is 24 inches square and deep, and painted white. Plastic and faux clay pots in the 30- to 36-inch-diameter range work well, but plastic will transmit the sun’s heat more readily than wood or clay, perhaps enough to damage roots. Wooden containers are prone to decay. You can significantly slow the decay process by coating the interior with asphalt roof patch. Whatever kind of container you choose, make sure it has good drainage; drill extra holes if you’re in doubt. To prevent soil from washing out, cover drain holes with small sections of window screen, but don’t cover the holes with stones. To facilitate drainage and allow good air circulation around the container, raise it slightly off the ground. Soils. Use a premixed sterile potting soil designed for container plants. Never use ordinary garden soil even good soil for container citrus. What is just fine in the ground just won’t work in a container. Once confined in a container, most garden soils are too dense and water drains too slowly. Though you can make your own soil mix (4 parts ground pine or fir bark and 1 part fine sand), unless you need a lot it’s more cost effective to buy it ready-made. Watering and Fertilizing. 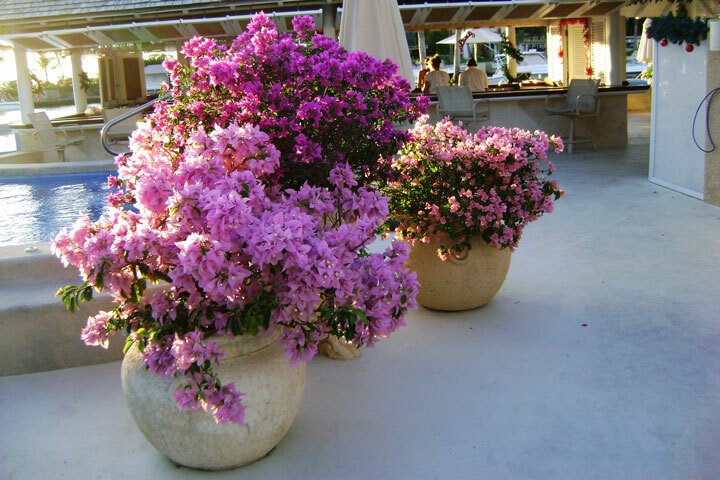 Plants in containers generally require more frequent watering than the same plants in open soil, and citrus are no exception. Especially during hot, dry, or windy weather, daily watering may be necessary. The basic rule is to soak the rootball thoroughly until water drains out the bottom once the top 2 to 3 inches of soil are dry. In some situations, water will drain out the bottom of the pot without soaking the rootball. This happens when the rootball dries and shrinks slightly, pulling away from the edges of the container. The water moves down the gap without rewetting the roots. To help rewet the dried rootball, place three or four drops of a mild dish soap on it. The soap will help the water soak in so the rootball can expand to fill the container again. Frequent watering causes needed nutrients to wash through the soil more quickly than is typical in most soils. Controlled-release fertilizers are less apt to immediately wash through soil, making a single applications useful for a longer time. 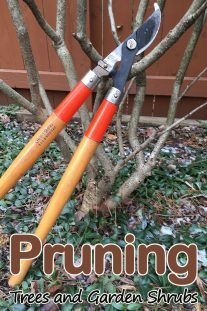 (Exactly how long depends upon the specific fertilizer and your watering frequency.) Soluble liquid fertilizers generally provide more exacting control but also require more frequent applications, every other week or so. In either case, follow the directions on the label of the fertilizer you choose. More than most plants, citrus are prone to deficiencies of the micronutrients iron, manganese, and zinc. Inadequate amounts of any one of them will cause leaves to yellow while veins remain green. Therefore it is a good idea to apply these to citrus in containers at least once a year. Look for them in the “chelated” form which makes the micronutrients more accessible to citrus roots. The best time is in early spring just as new leaves are beginning to emerge. Growing Citrus Indoors. 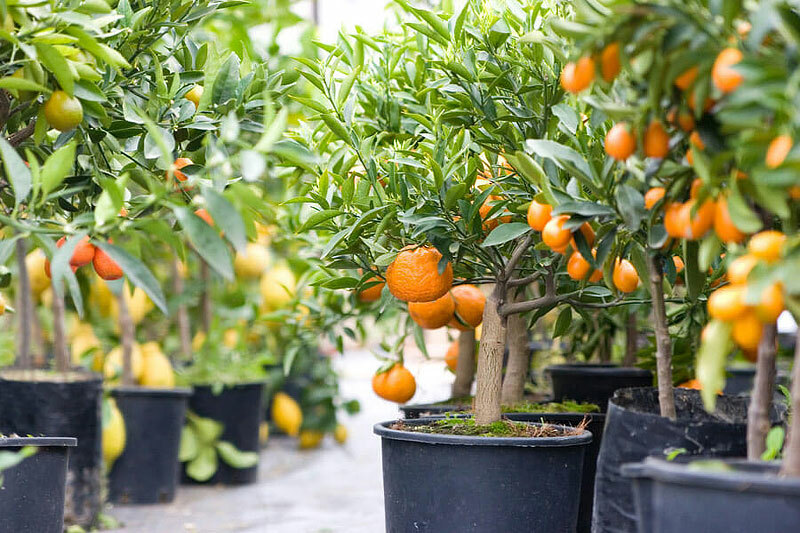 By moving container-grown citrus into a greenhouse, sunroom, or bright indoor location, gardeners anywhere can grow them. Most of the same rules apply, with a few differences. First, if you hope to harvest fruit, choose a naturally acidic citrus, not a sweet orange or grapefruit. Examples of acidic varieties include ‘Improved Meyer’ and ‘Ponderosa’ lemons, calamondins, and kumquats. These are most likely to produce fruit indoors in winter. Other citrus will grow and flower but are less likely to produce fruit. 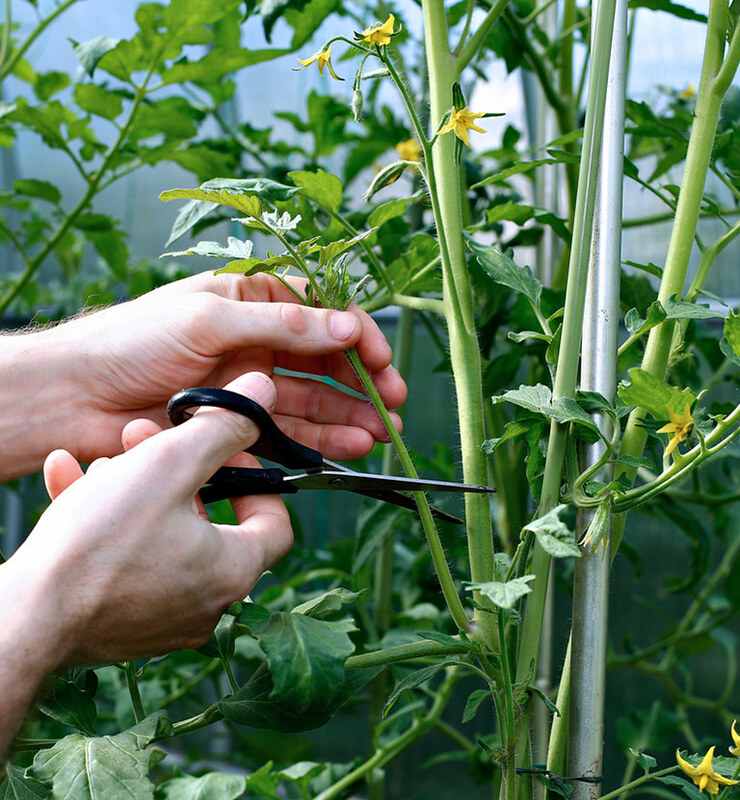 When moving your plants outdoors in spring or back indoors in fall, make the transition gradual, in at night, out during day, and lasting about a month. Also, before moving the plant indoors, shower it completely with warm and slightly soapy water to wash off any bugs. Pests that you don’t notice outdoors can become problems once inside. Compared to outdoors, homes in winter are darker and warmer, and have much drier air. That’s why anything you can do to provide additional light and extra humidity is so beneficial: grow lights, and a tray of pebbles under the pot. Cool, bright rooms, such as a partially heated sunroom, are best. Naturally acidic citrus, such as ‘Improved Meyer’ lemon, are best for indoor growing. Supply nutrients with controlled-release fertilizers to reduce the number of applications necessary through the year. Rewet dry citrus rootballs by placing a few drops of mild dishwashing soap directly onto the soil, then water with slightly warm water.